University of Saskatchewan, College Building, designed by Montreal firm Brown and Vallance, 1912, the centerpiece of the finest grouping of collegiate Gothic-syle buildings in Canada. Many architects from outside the province have influenced the nature of Architecture in Saskatchewan. Beginning in the territorial period, Dominion Architect Thomas Fuller designed Government House (1889–91) in Regina, then the capital of the North-West Territories. After the province was created in 1905, Toronto firm Darling and Pearson, well known for its bank projects, acted as provincial architects and completed the Land Titles building in Regina (1907– 09) and the Moose Jaw Courthouse (1908–09). Architectural firms from Montreal had a prominent role during the early years. In 1907, the firm of Maxwell and Maxwell was chosen through a limited competition to design the Saskatchewan Legislative Building. 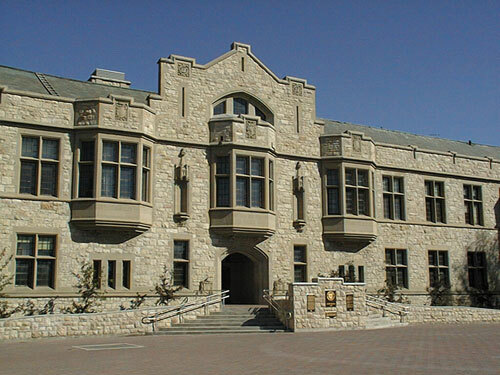 Another Montreal firm, Brown and Vallance, was chosen in 1909 by the board of governors of the University of Saskatchewan to create a master plan for the campus and act as university architects until the 1930s; they went on to design what has been identified as the finest grouping of collegiate Gothic-style buildings in Canada. They were also responsible for the first building for the Anglican Diocese of Qu’Appelle (1912), the Canada Life Assurance building (1912– 14), the Sherwood Department Store (1913; now the Saskatchewan Wheat Pool headquarters)—all in Regina—and the Fairbanks Morse warehouse in Saskatoon (1911). The Hotel Saskatchewan, built by the Canadian Pacific Railway in Regina and opened in 1927, was designed by the Montreal firm, Ross and MacDonald. The Bessborough Hotel in Saskatoon, last of the Chateau-style hotels, was designed by another Montreal firm, J.S. Archibald, and constructed from 1930 to 1932 for the Canadian National Railway. The Watson and District Heritage Museum is located in the town's immaculately preserved 1906 Canadian Bank of Commerce building. A prefabricated structure designed by notable Toronto architects Darling and Pearson (who incidentally were among the seven competitors seeking the contract for Saskatchewan's Legislative Building in 1907), the Watson bank was declared in 1977 by the Historic Sites and Monuments Board of Canada to be representative of a classical bank design which became a familiar western Canadian landmark. Many bank buildings in the province were designed by architects from Ontario, Manitoba, and the United States. 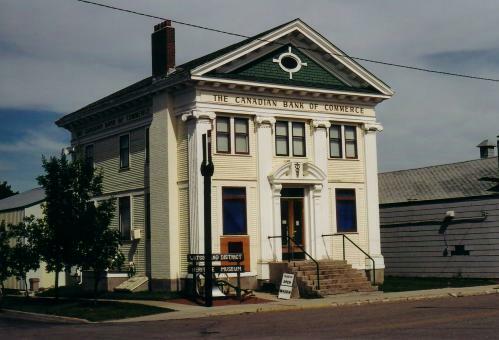 Prototypical, prefabricated wood bank buildings, designed by Darling and Pearson in the Classical Revival style for the Canadian (Imperial) Bank of Commerce, can be found in Watson (1906) and Nokomis (1910). Winnipeg firm Blair and Northwood designed buildings for the Northern Bank in Qu’Appelle and Regina (both 1906); and the Minneapolis firm, Lamoureax & Long, designed the Weyburn Security Bank (1910–11). During the 1930s, Modernist architecture arrived in the province through modest buildings like the Mainline Ford auto dealership in Indian Head (1937) and the CBK radio transmitter building (1939) in Watrous. This was the start of a trend still current, where projects are designed elsewhere as prototypical buildings that could fit on any site. In 1962, the Winnipeg architectural firm, Blankstein Coop Gillmor and Hannah (later number TEN architectural group), won the design competition for the Mendel Art Gallery in Saskatoon. Also in 1962, prominent American architect Minoru Yamasaki, known as the designer of the World Trade Center in New York, was chosen as the master planner and architect for the University of Regina. In 1966, the Toronto firm of John B. Parkin and Associates was chosen for their expertise in laboratories to design an extension to the Thorvaldson Building at the University of Saskatchewan. In the 1980s, a consortium of firms including prominent Canadian architect Arthur Erickson and the Saskatoon firm Folstad & Friggstad Architects completed a design for City Hospital in Saskatoon. In 2001, Douglas Cardinal, internationally renowned First Nations architect, completed the design of the First Nations University of Canada. Barnhart, G.L. 2002. Building for the Future. Regina: Canadian Plains Research Center; Kerr, D.C. 1998. Building the University of Saskatchewan. Saskatoon: University of Saskatchewan.